Minimal Fuss, Maximum Fun: ‘XC' means cross-country. ‘W' represents its wide-ratio transmission. ‘KTM' stands for winning. This model is a race-ready bike built for closed course enduro racing. With the agility of a 125 and enough muscle to take the fight to the 250 cc 4-Strokes, this bike punches well above its weight. That's why when the going gets tough, the tough get an XC-W. 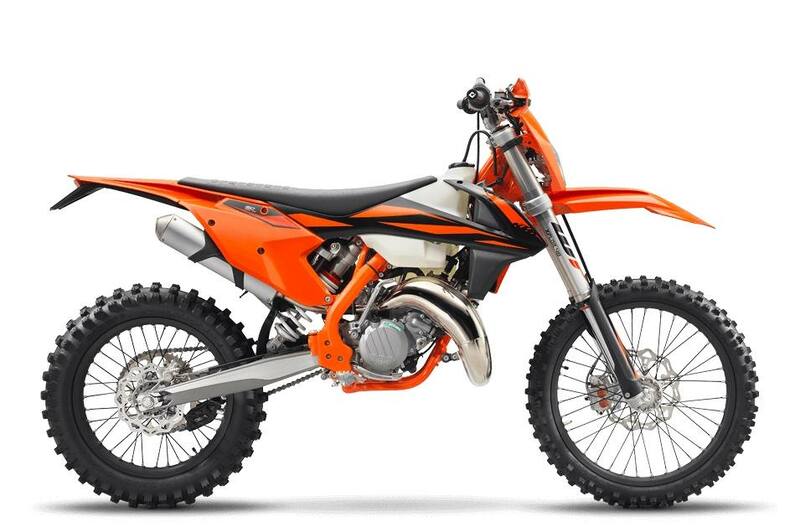 The KTM 150 XC-W engine is the most powerful and most competitive engine in its class, providing precisely the kind of power an Enduro rider wants. This 150cc ripper has been developed with the latest KTM engineering know-how and the most advanced technology available. The results: whopping power and mountain conquering torque across the entire rev range, while being extremely compact and light. Cylinder: This compact cylinder with a 58 mm bore features a cutting-edge power valve unit with a sophisticated mechanism for the lateral support exhaust ports. 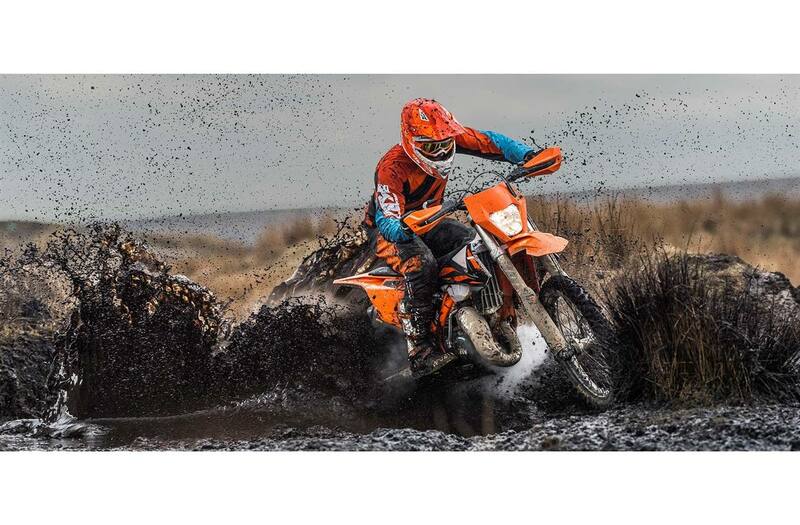 Matched to a twin-component cylinder head, it is KTM's secret to all-round grunt. The layout of the cylinder and head water jackets guarantee efficient heat dissipation when you're riding at your limit. Crankshaft: A reliable piece of engineering that has been skillfully balanced to guarantee minimal vibrations. It allows a decrease of the displacement to 125cc just by replacing cylinder, piston and head. There's no more need to change the crankshaft. Two-in-one in no time. Transmission: A wide-ratio 6-speed enduro transmission was designed specifically for the small 2-stroke enduro engine, its gear ratios perfectly in sync with the 150 XC-W's power band. The latest production technologies allow for compact dimensions and minimal weight. An advanced ´No Dirt´ gear lever design prevents mud or dirt build-up in the joint. Because even dirt lovers hate mud when it's in the wrong places. Piston: The 150 XC-W's piston is optimized for maximal reliability and the shape fits brilliantly to the cylinder layout. Ignition: All 2-stroke models feature a CDI control unit with an advanced hardware which improves the starting behavior of the engine. The ignition curves remain unchanged. Cooling: KTM's proven cooling system routes the coolant from the cylinder head through the frame triangle, directly to aluminum radiators made by WP. Thanks to flow optimized internal circulation and CFD-calculated ventilation, the system is superbly efficient. In addition,the radiator protectors improve heat dissipation. Especially in the mud. They are also integrated into the front part of the shrouds to protect the radiators in a crash. Swingarm: This design allows for an optimized mounting position of the PDS shock absorber, providing more progressive action. Furthermore, the cast aluminum design guarantees low weight and a perfect flex behavior. The single-component casting process also eliminates any inconsistencies and inherent weak points created by welding. And it's better looking. Front suspension: The WP XPlor 48 upside-down fork is a split fork developed by WP in close collaboration with KTM. It is fitted with a spring on both sides but features separated functions for each fork leg: compression damping is fitted on the left side, while rebound is on the right. The forks can easily be adjusted for compression and rebound with the twist of a dial on the top of the forks. In addition, a sealed hydro-stop guarantees excellent resistance to bottoming-out. Due to high-quality materials and a state-of-the-art production process, the WP XPlor 48 fork - with approx. 300mm of travel - has outstanding response and damping characteristics. A comfortable preload adjuster can be retrofitted and allows for a simple spring preload setting in three steps without tools (standard, +3mm, +6mm). Fuel tank: A lightweight polyethylene tank with a capacity of 10 liters. You will always be able to see how much fuel there's left at a glance, thanks to the see-through plastic. By pushing the orange release button in the center of the fuel tank cap, the bayonet mechanism makes refueling quick and easy. Footpegs: Sophisticated “No Dirt" footpegs prevent smudging up the pegs, even when digging in deep ruts. The pegs on the EXC models are 6mm higher than the ones used on SX models, which benefits ground clearance. But you can swap them at will. Decals: New graphics convey the READY TO RACE character of the 2019 KTM XC-W model line. Battery & wiring harness: These engines are fitted with KTM's proven E-starter - a unique KTM feature and a major benefit at all levels of offroad racing. A super compact lithium ion battery breathes life into the engine, while offering three times the starting energy of a conventional battery. The battery and wiring harness are centralized in a compartment above the air filter box, allowing the mechanic to remove the subframe without getting in conflict with the electrics. A happy mechanic, is a good mechanic.